Available to order online and in-store at Wildy & Sons Ltd.
To view the table of contents for Volume 8, visit Wildy & Sons Ltd. To view the title page, see here (PDF). At 684 pages in length, Volume 8 of the Yearbook comprises 44 contributions from 57 authors, including two current Justices of the UK Supreme Court (Lord Mance and Lord Sumption) and its former President (Lord Neuberger), one Lord Justice of Appeal (Sir Rupert Jackson), one Justice of the Caribbean Court of Justice (Justice David Hayton), one cross-bencher in the House of Lords (Lord Pannick QC), the Attorney-General of Northern Ireland (John F Larkin QC), the Lord Advocate (The Rt Hon W James Wolffe QC), eight eminent professors and 44 leading barristers, 34 of whom are leading silks (QCs) and most of whom argued cases before the Court in the past legal year. The full table of contents for Volume 8 of the Yearbook is available here. Volume 8 of the Yearbook features a symposium titled ‘Firing the Brexit Bullet – Who Pulls the Article 50 Trigger’ with 8 contributions from prominent commentators who closely followed or were involved in the Article 50 (‘Brexit’) case, Secretary for Exiting the European Union v R (Miller)  UKSC 5. Lord Pannick QC, who appeared successfully for the eponymous claimant, Ms Gina Miller, at first instance and on appeal provides his personal reflections on the Miller litigation in a Foreword to the symposium. Professor Nick Barber, Professor Jeff King and Dr Tom Hickman reflect on their important post on the UK Constitutional Law Association blog, which Lord Pannick QC credits in his Foreword as being the origin of the Miller litigation. Professor Sir Jeffrey Jowell KCMG QC and Professor Timothy Endicott consider the implications of the Miller case for the UK constitutional settlement and the balance of powers within that settlement. The Attorney-General of Northern Ireland, John F Larkin QC, the Lord Advocate, The Rt Hon W James Wolffe QC, and the leading counsel for the Counsel General of Wales intervening in the Miller case, Richard Gordon QC, analyse the devolution dimensions in the Miller litigation and its implications for each of the devolved jurisdictions of Northern Ireland, Scotland and Wales. A critical constitutional response from a Northern Irish perspective is provided by two distinguished professors, Professor Christopher McCrudden FBA and Professor Daniel Halberstam, who were involved in the Agnew reference from Northern Ireland to the UK Supreme Court and heard alongside the appeal in the Miller case. Seats are very limited and prior reservation is essential. You can register to attend the launch event by emailing the Editor-in-Chief of The UK Supreme Court Yearbook, Dr Daniel Clarry, who will notify successful registrants. Quinn Emanuel Urquhart & Sullivan LLP has kindly agreed to sponsor the launch event for Volume 8 of The UK Supreme Court Yearbook at the UK Supreme Court on 22 February, after previously sponsoring the launch event for Volume 7 of The UK Supreme Court Yearbook at the House of Commons. 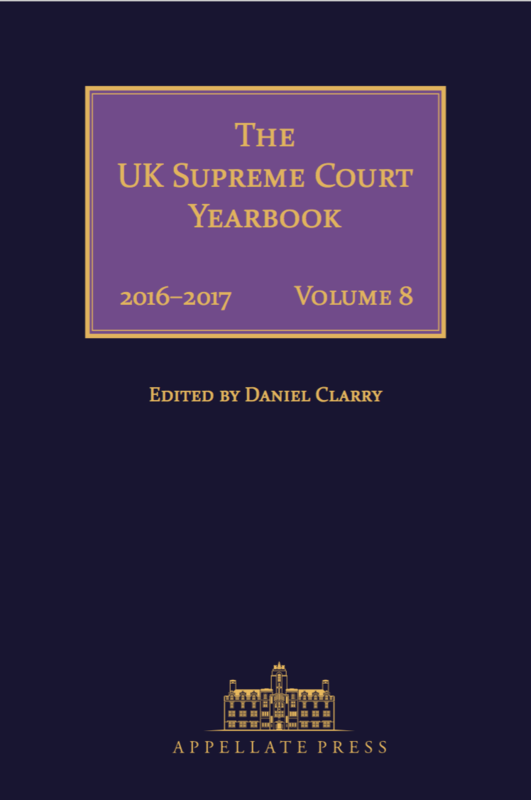 All eight volumes of The UK Supreme Court Yearbook collection are available to order online and in-store from Wildy & Sons Ltd. This entry was posted on February 16, 2018 by Constitutional Law Group in Uncategorized and tagged Article 50 TEU, Brexit, Brexit judgment, Miller v Secretary of State for Exiting the European Union, UK Supreme Court.